When the three billy goats Gruff are hungry, they see bountiful grass to eat across an old bridge. But the bridge is home to a terrible troll, who is peckish himself, and looking for a tasty morsel to gobble up. In his interpretation of the timeless tale, Jerry Pinkney shows there's little good to come from greed--but in the end, redemption for even the most trollish bully is possible. A dramatic gatefold heightens the climax of this brilliant rendition. 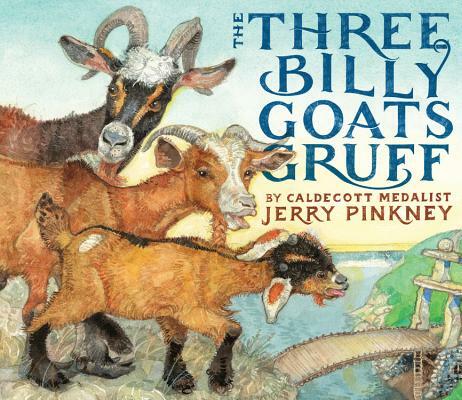 Jerry Pinkney has the rare distinction of being the recipient of five Caldecott Honors and the winner of the 2010 Caldecott medal. He has won the 2016 Coretta Scott King-Virginia Hamilton Award and Laura Ingalls Wilder Award for Lifetime Achievement, the Coretta Scott King Award five times, the Coretta Scott King Honor four times, and has been nominated for the prestigious Hans Christian Anderson Award. He was also the first children's book illustrator elected to the American Academy of Arts and Sciences.